Just when I thought our weather couldn't get any weirder, last week happened. If I remember correctly, the last time I checked my calendar it said "July". Right? We're in July...right? It's been so nice here lately. Summer has really (finally) blossomed- and I am just loving every second of it. The days are longer, the mornings are warmer, jeans are in the back of my closet...dresses are full throttle, Food Trucks are everywhere! Times are basically fantastic. Then last week, it rained. For two days. SMACK! Rain? In July?? Not only did it rain, but it rained hard. Also included- thunder. What in the world? But here's the really weird part- it was still, oddly warm. It wasn't the usual bitingly cold I was used to whenever it rained here. No, this time it was sunny-grey (actually quite beautiful) all around and really really warm. The only other time I've felt this strange mix of weather was when I was in Hawaii. Now I'm not complaining- although I would rather it be sun-shiny-sunny-sun-time in place of any sort of grey...the warm rain was really enjoyed. Today? HOT. HOTTTTTTTTTTTTTTTTTTTTTTTTTTTTTT. Hottie- hot- hoterton. It's 9am and I'm sweating. Now over the 4th of July holiday we just had, there was NO rain in sight. In fact, it was a very incredibly gorgeous day. Things were slower that day, busy indeed...but among that busyness was a sort of joyous calm. Maybe it had to do with it being a holiday, maybe it had to do with it really seeming like summer...or maybe it had to do with all of the delicious food I knew we'd be eating that day- whatever the case, I was in heaven. One of the perks of this time of year is the abundance of DELICIOUS berries, which are all definitely in season..and at their peak. Every store and farmer's market is just covered in the most beautiful array of red, blue, and purple colors from all the berries. Deep blood reds from strawberries, bright bold reds of raspberries, deep dark purple blackberries...you get my point. Ahhgg my favorite! So come Independence Day, I knew I wanted a dessert to share that included some sort of berry. After heading to our local market and browsing around for a while, the organic raspberries just sung to me. They were so lovely in all their red hues, that I just couldn't resist. Plus, my husband loves raspberries. Total score. Having just ripped this recipe out of my Country Living magazine, I knew right away this was the winner winner chicken dinner. <--What? Plus, I have had some cardamom in my spice cabinet for a few months now and have been looking for a good recipe to use it in. I bought it because I "knew" I'd be making all the Norwegian desserts I could possibly get my hands on (my husband's family is Norsk)..and have since made...0. Nadda. Ziltch. Zip. Oh me. If you're unfamiliar with the spice, cardamom is a tad pricey but worth it in my opinion. It has a very perfume-floral like scent and an almost citrus taste to it. Used in A LOT of Scandinavian recipes, it's become a flavor I just adore. My husband's grandmother (Mormor as we call her) makes some delicious bread with the stuff. OH MY WORD. A little goes a long way, and in this particular recipe, the spice really shines. The end result was pretty much your typical poundcake, but better. Dense, rich, moist, but strangely light at the same time. Then generously drizzled drenched with almond icing? Oh gosh...best part. 1. Preheat your oven to 350*F.
2. 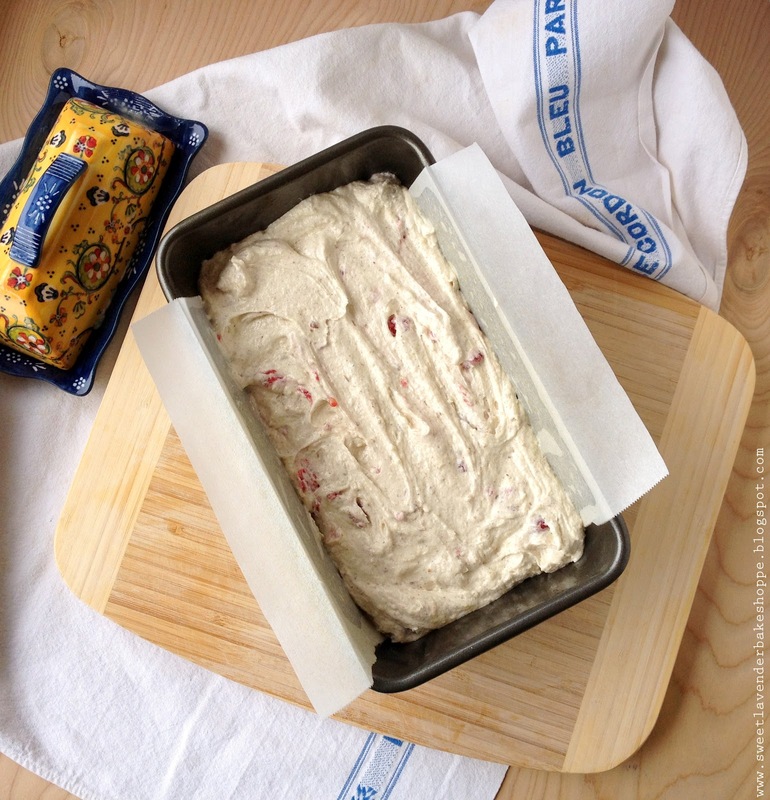 Butter a standard 9x5" loaf pan. Next, line bottom and sides with a strip of parchment paper, with some overhang. Butter again. Set aside. 3. 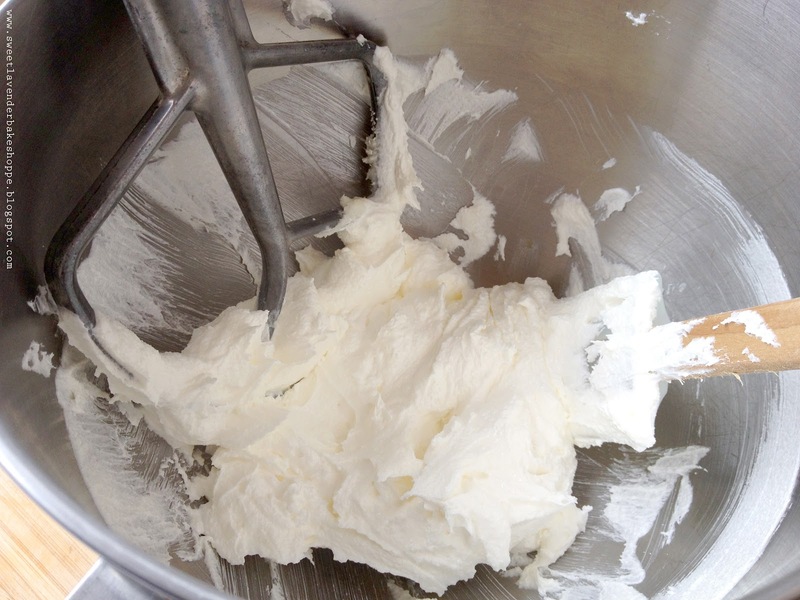 In your mixer bowl, add room temperature butter and vanilla sugar. Beat together with a paddle attachment until it is completely creamed: fully incorporated, light, fluffy, increased in volume, very pale in color. This should take about 5-7 minutes on medium speed. See above picture; notice the yellow color of the butter is now ivory white. 4. 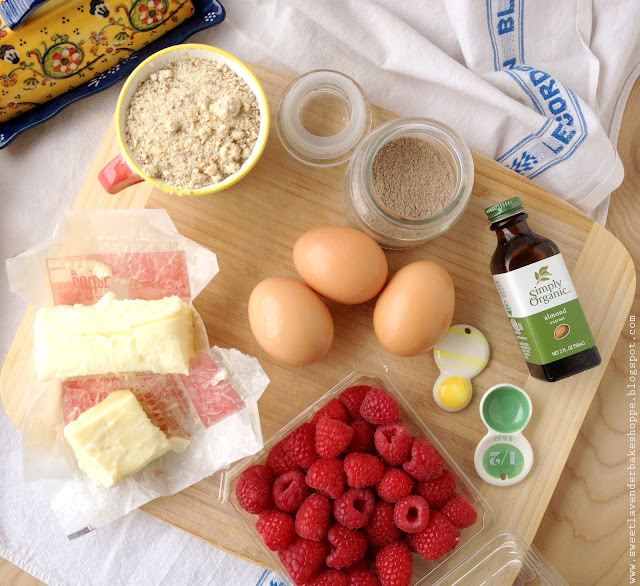 While your butter/sugar is creaming, in a separate bowl combine eggs, vanilla and almond extract. Whisk together. 5. In yet another bowl, sift together your flour, cardamom, baking powder and salt. 6. Once butter mixture is creamed, slowly drizzle in egg mixture, stopping and scraping down sides and bottom of bowl. Mix together on medium-low until fully combined. 7. Next, on a slow speed alternately add in your dry sifted ingredients with your room temperature milk. Stop and scrape down sides and bottom of bowl. Mix again until JUST combined. Do not overmix. 8. 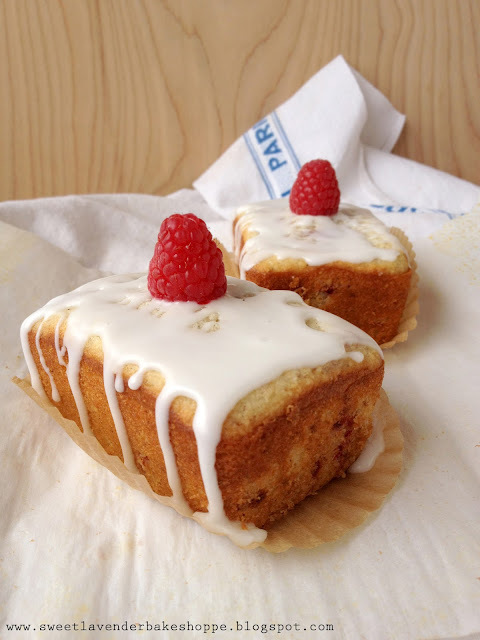 Now, with a spatula, hand-fold in almond meal and your fresh raspberries. 9. Pour batter into your prepared loaf pan, smooth top, and bake approximately 35 minutes or until toothpick comes out with crumbs. 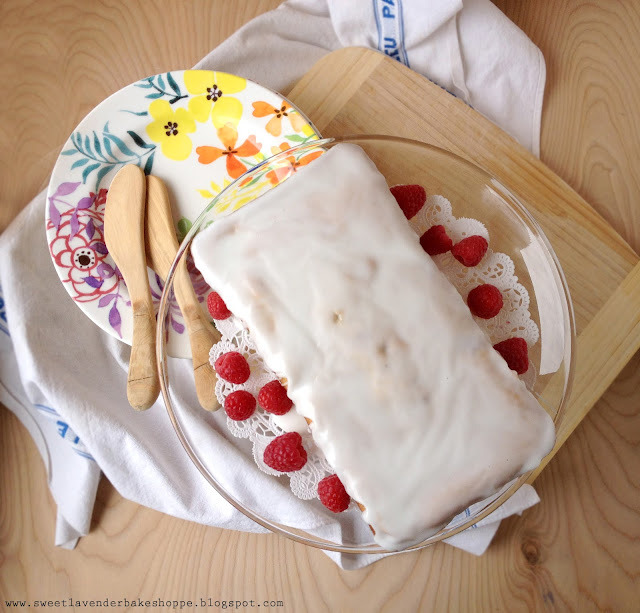 Let cool until room temperature before icing. 1. Whisk together all ingredients. You're looking for a thick consistency- but one that is pour-able (like pancake batter). Too thick? Add a tad more milk. Too runny? Add more powdered sugar. 3. 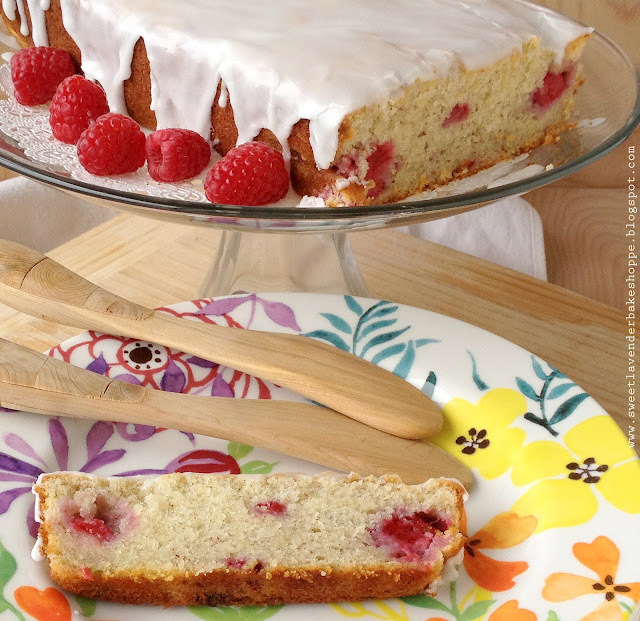 Let set up about 5 minutes, garnish with remaining handful of berries and slice it up! Extra batter? Do what I did and pour into prepared mini loaf pans (or cupcake pans), bake about 10 minutes (until toothpick comes out clean) at 350*F, cool, and ice! I let set up about 10 minutes, packaged in cellophane bags and gifted them to two loved ones. Hehe, thanks! They're from the beloved Anthropologie! Yum! Love cardamom! Looking forward to trying. 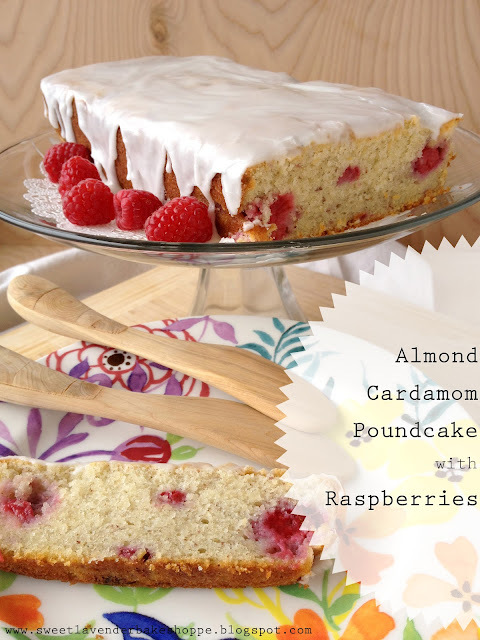 I love the fruity raspberry flavor...I will make time for this special poundcake this weekend. Yummy! Anyhoo, we have been keeping an eye out for unique and interesting bloggers with phenomenal photography skills, and yours caught our attention! We have just recently launched a food photo submission gallery http://www.yumgoggle.com/gallery/ that allows you to showcase all your great work and share it with all of our visitors. We’d be proud to have your work as part of our growing collection to continue to have a larger reach and further inspire all fellow food lovers out there! oh gorgeous - such fabulous flavors & ingredients!! The pic your attach give me more clear idea that how to bake with care. Thanks for sharing this yummy almond cardamom poundcake with raspberries. To how many persons I can serve this cake?